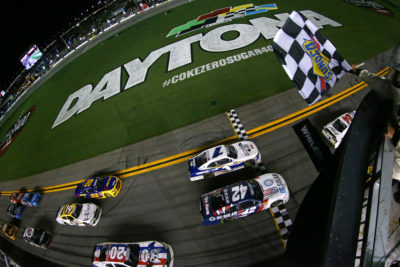 Credit: 356607(Photo by Sarah Crabill/Getty Images) DAYTONA BEACH, FL – JULY 06: Kyle Larson, driver of the #42 DC Solar Chevrolet, takes the checkered flag ahead of Elliott Sadler, driver of the #1 ARMOUR Chili Chevrolet, to win the NASCAR Xfinity Series Coca-Cola Firecracker 250 at Daytona International Speedway on July 6, 2018 in Daytona Beach, Florida. Car 24 Justin Haley FOE Chevrolet thought he won the race but he crossed the yellow line to gain an advantage & the lead of race. All it took was NASCAR to see the replay & see he crossed the yellow line, so the awarded the win to Kyle Larson. 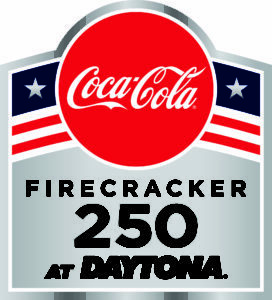 Starting from 7th place Car 342 Kyle Larson DC Solar Chevrolet won the 17th Annual Coca-Cola Firecracker 250, his 11th win in 106 NASCAR XFINITY Series races. This is his 3rd win & 3rd Top 10 finish in 2018. This is his 1st win & 5th Top 10 finish in 8 races at Daytona International Speedway. 2nd Place Car 31 Elliott Sadler ARMOUR Chili Chevrolet, started from 5th place posted his 10th Top 10 finish in 19 races at Daytona International Speedway. It is his 14th Top 10 finish in 2018. 3rd Place Car 320 Christopher Bell GameStop PDP Toyota, started from 6th place posted his 1st Top 10 finish in 2 races at Daytona International Speedway. Christopher Bell was also the highest finishing rookie. 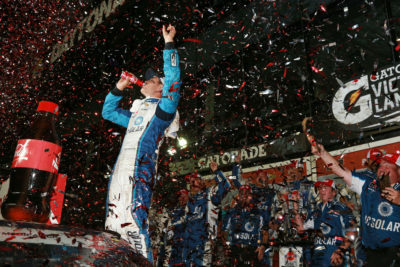 Credit: 356608(Photo by Matt Sullivan/Getty Images) DAYTONA BEACH, FL – JULY 06: Kyle Larson, driver of the #42 DC Solar Chevrolet, celebrates in Victory Lane after winning the NASCAR Xfinity Series Coca-Cola Firecracker 250 at Daytona International Speedway on July 6, 2018 in Daytona Beach, Florida. 4th place Car 322 Ryan Blaney Pirtek Ford, started from 2nd place followed by 5th place Car 361 Kaz Grala Kiklos Extra Virgin Olive Oil Ford, started from 38th place. 6th Place Car 33 Shane Lee Childress Vineyards Chevrolet, started from 14th place followed by 7th place Car 366 Timmy Hill CrashClaimsR.Us Toyota, started from 36th place. 8th Place Car 321 Daniel Hemric South Point Hotel & Casino Chevrolet, started from 4th place followed by 9th place Car 3 Justin Allgaier Breyers 2in1 Chevrolet, started from 7th place. Lastly in the Top 10 was Car 34 Ross Chastain Georgia Watermelon Association Chevrolet, in 10th place, started from 16th place. 15th Place for Canadian Car 36 Alex Labbe Can-Am/Wholey/Cyclops Gear Chevrolet. Elliott Sadler leads the point standings by 12 points over Daniel Hemric. 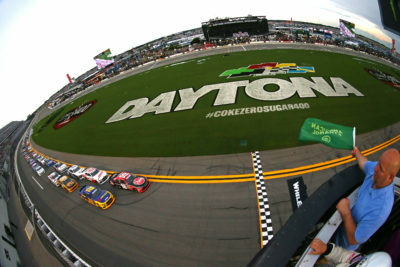 Credit: 356601(Photo by Sarah Crabill/Getty Images) Ryan Preece, driver of the #18 Rheem Toyota, and Ryan Blaney, driver of the #22 Pirtek Ford, take the green flag to start the NASCAR Xfinity Series Coca-Cola Firecracker 250 at Daytona International Speedway on July 6, 2018 in Daytona Beach, Florida. The race had 6 Cautions for 29 Laps & 2 big crashes: 1st Caution on lap 32 for Stage 1 Completed. 2nd Caution on lap 62 for Stage 2 Complete/19 spin frontstretch. 3rd Caution on lap 73 for #16 Spin Turn 4. 4th Caution on lap 83 for #60, 2, 11, 9, 46, 35, 21, 51, 52, 36, 40, 19, 16, 78, 0, 15, 8 a big crash in Turn 1 [red flag). 5th Caution on lap 89 for #55, 99, 40 Crash turn 3. 6th Caution on lap 99 for #00, 16, 90, 93, 39, 01, 19, 36, 38 a big crash on the frontstretch. 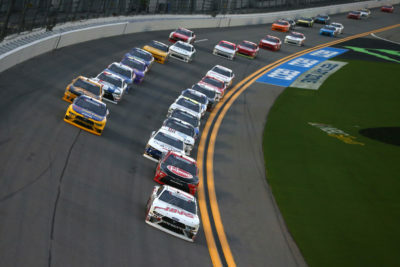 Credit: 356600(Photo by Sarah Crabill/Getty Images) Cole Custer, driver of the #00 Haas Automation Ford, leads a pack of cars during the NASCAR Xfinity Series Coca-Cola Firecracker 250 at Daytona International Speedway on July 6, 2018 in Daytona Beach, Florida. 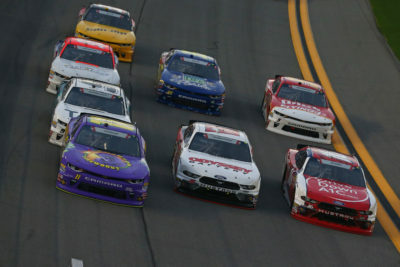 The race has 10 Lead Changes: 10 among 5 drivers: 0; C. Custer 1-8; K. Larson(i) 9-32; R. Blaney(i) 33-57; K. Larson(i) 58-63; J. Haley(i) 64; R. Blaney(i) 65-77; E. Sadler 78-80; R. Blaney(i) 81; E. Sadler 82 -95; K. Larson(i) 96-105.
Credit: 356603(Photo by Sarah Crabill/Getty Images) Ryan Truex, driver of the #11 Phantom Fireworks Chevrolet, Austin Cindric, driver of the #60 Odyssey Battery Ford, and Ryan Reed, driver of the #16 Drive Down A1C Lilly Diabetes Ford, race during the NASCAR Xfinity Series Coca-Cola Firecracker 250 at Daytona International Speedway on July 6, 2018 in Daytona Beach, Florida. 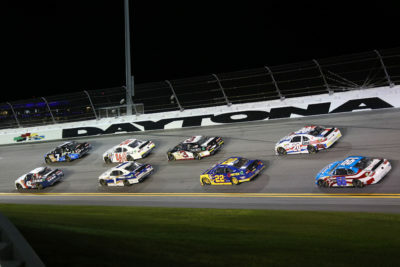 Credit: 356609(Photo by Jerry Markland/Getty Images) DAYTONA BEACH, FL – JULY 06: Kyle Larson, driver of the #42 DC Solar Chevrolet, and Justin Allgaier, driver of the #7 Breyers 2in1 Chevrolet, lead a pack of cars during the NASCAR Xfinity Series Coca-Cola Firecracker 250 at Daytona International Speedway. Race Comments: Prior to the start of the race, the following cars dropped to the rear of the field under penalty: Nos. 45 (engine change), 16, 51, 55 (unapproved adjustments), 38 (missed driver’s meeting). Failed to Qualify: N/A. Time of Race: 2 Hrs, 01 Mins, 35 Secs. Average Speed: 129.541 MPH. Margin of Victory: 0.005 Seconds. Caution Flags: 6 for 29 laps. Lead Changes: 10 among 5. Mahle Clevite Engine Builder of the Race: Hendrick Engines, #42. Mobil 1 Driver of the Race: Elliott Sadler, #1. Sunoco Rookie of the Race: Christopher Bell, #20.